Fast Company just named Get Schooled to its 2017 50 Most Innovative Companies list, with a special Top 10 in Gaming distinction. Help us spread the word of this amazing accomplishment. We invite all of our partners, educators, students, and friends to share the news on their websites, social channels, and email distribution lists. We could not have done this without you! You can view our listing and profile on the Fast Company website. This media kit contains a few resources to help you get started. Feel free to share the official press release with your networks. It can be distributed via your email lists, newsletters, or blogs. Please direct all media requests for Get Schooled to Melisa Charles at mcharles[@]FYIBrandComm.com or for Fast Company to Mary Wible Vertin at mvertin[@]fastcompany.com. Click here to download the press release. 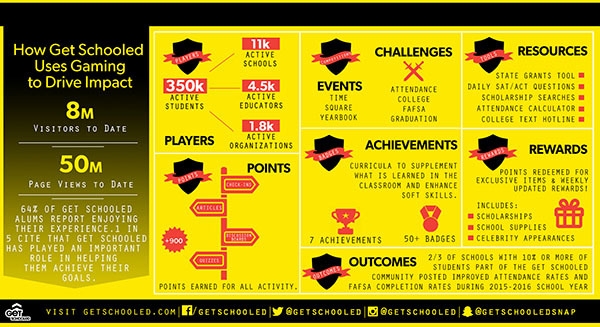 We created a simple infographic to highlight the the ways Get Schooled utilizes the mechanics of gamification to improve educational outcomes for students and schools across the nation. You can download the infographic as both a JPG and PDF. This is exactly the kind of news worth posting on your Facebook page or tweeting to your followers. Here are a few sample posts you can use to craft your own customized message! Congrats to @getschooled being one of @FastCompany's Most Innovative Companies in Gaming! See what they do to help students go to college. Proud of our partners @getschooled and all their work helping students go to college. They're one of @FastCompany’s Most Innovative Companies. Happy to be part of @getschooled's movement helping students. Congrats to being one of @FastCompany's Most Innovative Companies in Gaming!